Nevertheless the financial operations could be performed really intuitive, Texas Instruments added a convenient accessible Quick-Reference Guide to the calculator. It is covered by a small hood near the display. We know only few financial desktop calculators from Texas Instruments, the non-printing BA-20 and the printing BA-45 Micro Business Manager. But only this TI-5310 performs calculations with 12-digit capability. As usual with rare calculators we dismantle the TI-5310 to reveal his genes. Just removing the top part of the housing gives access to a well know construction. It is typical for a Japanese calculator: Only few components fitted directly in the bottom shell of the housing. The printed circuit board (PCB) of a calculator usually carries some designations of the manufacturer. But this TI-5310 tries to keep his secrets. The board holds a NEC uPD7519G integrated circuit, a 4-bit microcontroller of the uPD7500 series discovered already in the BA-45. Everything else looks common. During clean-up of the housing parts we noticed another, very important detail of the calculator. It was tested according to the UL Standards common in the United States. And just this little logo on the nameplate spills out the secret! Every company submitting a product to Underwriters Laboratories Inc. (UL) receives an UL-File Number like E12345. Driven by the wide usage of the Internet the www.ul.com website provides the service of online access to the UL Certification Informations. Electronic calculators Models TI-5045, -5045II, -5120, -5130, -5140, -5142III, -5150, -5160, -5219II, -5320, -5320II, -5330, -5340, -8230 . Reprinted from the Online Certifications Directory with permission from Underwriters Laboratories Inc.
To be honest, this was NOT the information we expected. 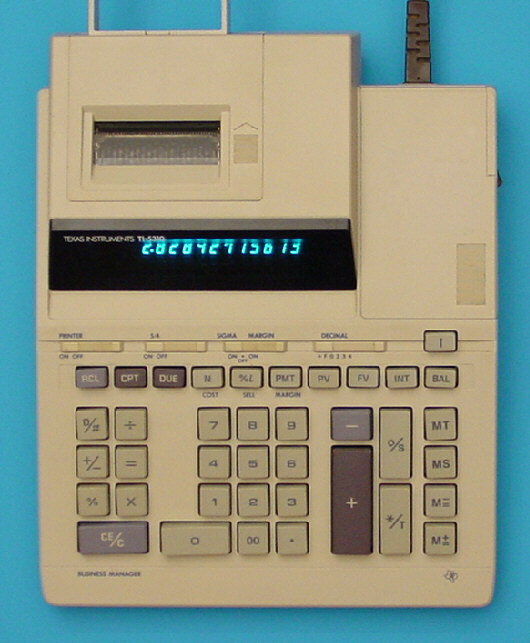 In other words: A whole line of desktop calculators in the timeframe between 1981 and 1989 was manufactured by Toshiba TEC Corp. We found already with the plain calculators like the TI-1750 and TI-25 introduced in 1977 and 1978 the genes of Toshiba. Just compare some Toshiba - Texas Instruments sibblings here. Curious about the sources of some other Texas Instruments desktop calculators ? Visit the UL Listed directory. This mark is a registered trademark of Underwriters Laboratories Inc.
© Joerg Woerner, November 9, 2003. No reprints without written permission.